Club Penguin Cheats by Mimo777 Club Penguin Cheats by Mimo777: Club Penguin Mountain Challenges Reviewed By You! "I always love new things on Club Penguin. I also love exploring new things. I'm going to love the mountain exploration. I wish there would be challenges to face and solve for the event. Maybe like saving or helping other penguins on the mountain or exploring new parts and places of the mountain like a cave or a tunnel! There's going to be a lot of exploration and adventure! I'm so excited!!" Awesome, review! For next week, Club Penguin wants to know what we think about igloos and what our favorite kind of igloo to decorate is? I can't wait to hear what kind of iggy you like! i knew it... the moutian expedition is were the new education room will be. My favorite igloo is the log cabin. I bought it a couple years ago and havn't bought another igloo since. My log cabin's cozy! I really love the backyard iggy because i make pools out of blue puffle beds and then make a campfire. I have a lot fun with my pals. So when are you tell us the update for the CPG MOD? come to my party plz! cool! 2 days till the expidition woot! oh wow the tent?! thats cool i must have got here early!! I like the "Secret Deluxe Stone Igloo"
P.S. yea please maxmook whats the code? and i will give you it ok? At Disneyland at orlando,florida is working on a theme park of Club Penguin! It may be called "Disney Club Penguin Theme Park" and located inside Disneyland! I found out about this when I when There and saw a small sign of it! 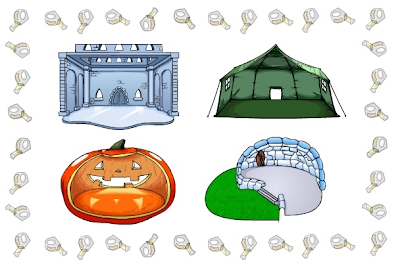 The tent igloo was from he camp part back in 2007 and it was the only time it showed up. i liked the green tent and the log cabin. they were so fun! is anyone excited for next friday for the catalog? i heard u can make ur own furniture. I just got to 95 stamps and I am working on the hockey team one. I need some people to come to the Soccer Pitch around 4 Club Penguin time today--wednesday! Come with a blue hockey jersey! Thank you all so much for helping. i knew it... the mountain expedition is were the new education room will be. It is? I thought and hope Club Penguin has forgotten about the education thing. Mine is probably the Secret Deluxe Stone Igloo. But I like them all too. My favourite igloo is the log cabin. I bought it a couple years ago and havn't bought another igloo since. My log cabin's cozy! Sounds cool. I just want to fall asleep right now hearing cozy! I think the Fish Bowl is awesome too! But I also agree with you about the Double Story igloo. Sometimes that's fun. Education room? You mean for the "21st Century Sesame Street"? I didn't know they were making a new room! I think they would have told us about it by now, because the Mountain Expedition is, like, tomorrow! Good idea though! Lol! Poor blue puffles. They try to go to bed but end up getting wet. And I'm pretty sure they can't swim. LOL. Also, can you please not put CPG mod when you aren't modding? Thanks! Nice! Time has flown by so fast! It seemed like yesterday when I was groaning about how far away the Mountain Expedition was! I. Can't. Wait! I hope lots of people come! This is going to be fun! Ok, ok! I'll come as long as you don't put too many !!! ! Lol! Water breaks? In the freezing cold...? Ok! Sounds fun! Freezing my mouth, lol! Yeah it is! It's cool like a block of ice... outside... in antarctica... n the middle of a snowstorm... you get what I mean. Actually, CP updates early sometimes! So maybe 1 day! Not even one day... 18 hours and 25 minutes! Woot! Yeah! I like the tent! You can pretend you are camping out. I camped out with my friend and he left and came back dressed up as a bear. *shudders* I had nightmares that night. Yeah. I got it once. But it was too small so I moved! :) It is pretty cool though! Awww! I missed it by 1 hour. :( I want that one too! Nobody seems too excited for Ice Hockey in the summer though! =P I'll help you any time you need it! I only have around 23 stamps! LOL! Silver here again. I am still trying really hard to get all the stamps! I am now at 96 stamps! SO close! The last game stamp I am working on is the 5,000 shooting the tube combo. Can you actually do this in freestyle mode? And tips on how you all did it? ~~~~~~~~~~~~~~~~~~~~~~~~~~~~~~~~~~~wow you must love the lob cabin must be very cozy in the winter with a fireplace! Log cabin! It seems so cozy, and if you add a fire place, a couch, and some lights... it would be so cozy looking! Too bad I wasn't a member when they had the log cabin!! Hope they come back with it soon! Hey Bolt fast, nice too see that you want to be a mod but don't put CPG mod unless you are modding a comment (Like I am right now). It's been awhile since the last shake up but I think a lot of it is that because so many people are away or busy during the summer Mimo wants to give them a chance to get back and modding. Thats just what I think. Thats why you dont say "first" because Mimo has to read all the comments before he posts them so people before you may have commented but haven't been approved yet.